This batch of Tahini Chicken Tea Sandwiches was made for a little casual afternoon tea, but it will be on the menu at my next proper afternoon tea party, along with Cucumber Sandwiches and Sliced Egg and Dill Sandwiches. 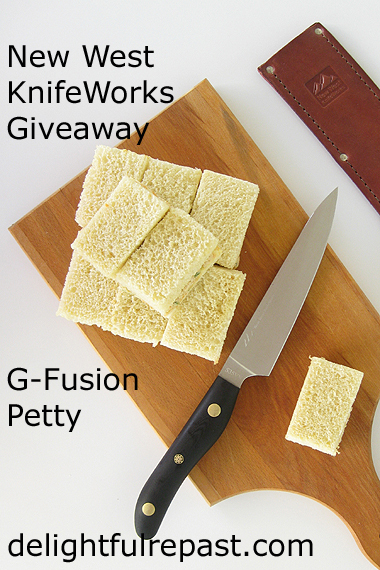 But before I go on (and on) about tea sandwiches, I want all of you who are not into that sort of thing to know that this knife we’re giving away is not just for tea sandwiches, so don’t click away! The New West KnifeWorks G-Fusion Petty Utility Knife is probably the most versatile knife in my collection. For this recipe alone, I used it for butterflying chicken breasts; chopping onion, fennel and cooked chicken; and cutting sandwiches. And it does so much more. It’s big enough and the right shape to use as a small chef’s knife and small enough that some cooks even use it as a paring knife. The razor-thin blade makes it great for filleting, boning and trimming silverskin. I have wasted so much tahini over the years. Love that stuff! And I use a lot of it in my Hummus and Baba Ghanoush (pardon those pictures, by the way, I was just starting out! ), but then there’s always some left over. What else can I do with it? Mr Delightful is not a fan of dips, so I wanted to use it in a way he would enjoy, too. He likes chicken salad sandwiches, so there you go. He’s not fussy about his sandwiches being perfectly cut, but (and now I’m talking to my Tea People) tea sandwiches must look as good as they taste. They must be cut very cleanly; squished sandwiches and ragged edges are simply not the done thing. So tell me, what is your favorite tea sandwich? And be sure to go to the section below the recipe for details on this very generous giveaway. If you don’t happen to need a knife, you know someone who does; and this knife would make a great and generous gift. 1 In dry skillet, toast the sesame seeds over medium heat, stirring frequently. Remove to 1.5-quart bowl to cool. 2 In same skillet, still hot, heat the olive oil. Add the chicken breasts and cook, loosely covered, over medium-low heat about 15 minutes on each side, depending on the thickness of the pieces. Season each side of chicken with up to 1/8 teaspoon each salt and pepper. Remove to plate to cool. Note: I used the New West KnifeWorks Petty to butterfly the chicken breasts, so they needed just 10 minutes on each side. Set aside to cool. 3 Add onion to skillet and cook until very soft, about 5 minutes, deglazing the pan with the onion juices, scraping up any brown bits. Add the onion and oil to bowl with sesame seeds. 4 Chop the cooled chicken and add it to the bowl. Stir in the carrots, fennel or celery, tahini and lemon juice. Add the curry powder and remaining salt and pepper. Taste and adjust seasoning. Cover and chill for at least an hour before assembling sandwiches. 5 Spread each slice of bread thinly with softened butter. Divide the chicken salad (about 1/4 cup each) among the 8 bottom bread slices. Top with remaining buttered bread slices. Trim off crusts and cut each sandwich into four fingers or rectangles, arranging on a plate in about three layers. 6 Lay a good-quality un-dyed paper towel on top of the sandwiches. Wet and wring out well another paper towel; lay the damp paper towel on top of the dry paper towel. Never place the damp paper towel directly on top of the sandwiches or they will become soggy. Wrap rather snugly with plastic wrap; refrigerate for at least an hour or up to several hours. This will make your sandwiches “hold together” and keep them from drying out. 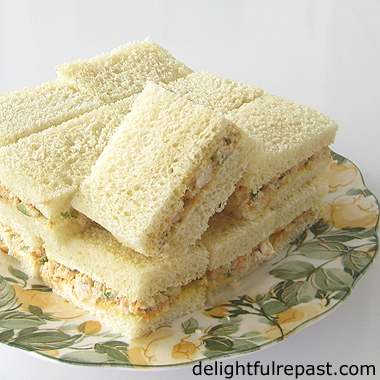 Remove from refrigerator and uncover sandwiches just before serving. This giveaway is open to readers in the US* who are 18 years of age or older. To enter, leave a comment below (one entry per person). Tell me the first thing you'd make with the knife and/or which color you'd choose. Please include your email address in the body of your comment. Must enter by 11:59 p.m. Eastern time Wednesday February 13. Winner will be chosen by random drawing and be announced here in the comments before noon Eastern time on Thursday February 14. If I don't hear back from the winner of the random drawing by noon Eastern time Sunday February 17, a new winner will be selected from the original entrants (those who commented before the giveaway deadline). I eat tahini spoonful, both white and black! These sandwiches look delicious, Jean. Your sandwiches look so delish, Jean, and such a great way to use leftover tahini. If I won the knife, I would choose red and I'd slice some onions for French Onion Soup. Thank you, Kitty! And now you've got me craving French onion soup! Zaa, thank you so much. I hope you and your grandchildren enjoy the sandwiches. I think an artist like you is bound to fall in love with tahini! Sherry, isn't ham and orange a wonderful combination! Sounds like you could use another knife--black or brown it is. Yah, yah, not a tea sandwich aficionado…but your knife sharpens my appetite! I would love the knife in Mtn Huckleberry or Sherwood and would use it for everything! It's the perfect size for all kinds of cooking jobs. My son is a potato lover. So, my first duty would be to peel a potato with this beautiful knife! My favorite color is blue. So any shade of blue would be perfectly fine with me! I will use the knife to debone chicken thighs which will be stacked on a vertical skewer and then smoked to be used in tacos! A black petty knife would be a terrific addition to my block! Well I couldn't imagine using tahini and chicken in the same sentence, until I saw curry. OK. Now it makes sense. I'll take one, please. Set it right next to the cucumber sandwich, please. Sounds like a fantastic knife!! What a beautiful recipe, what a beautiful knife! I'd use it endlessly. It would be particularly helpful in the summer when I carve a watermelon into a basket and serve melon balls/grapes fruit salad. I would use the knife for creating gluten free meals. I want to prepare food for our new daughter in law, and would like Peacock if selected. In the meantime can't wait to make tea sandwiches. I would make my killer homemade spaghetti sauce. Black for me. I'd choose classic black, and prep some bacon wrapped venison for the grill. Nice sandwich, you could also sub mashed chick peas for the chicken as a veggie option. The first thing I'd make would be a classic mango curry chicken salad sandwiches. I'd loke the burgundy/red color one. I'm one for sandwiches or any foods you have to slice with a knife😁 ..these knives are just a beauty ,color? like them all!! I have not ever posted here before, but I would use a blue knife to cut alder smoked coho salmon drizzled w/blackberry sauce. I would like an ORANGE handled knife. ORANGE was the favorite color of my idol Frank Sinatra. Frank said ORANGE was a HAPPY COLOR. I agree. The first thing I would make is a salad that contains a lot of vegetables that need peeling and chopping (celery, cucumbers, carrots, bell peppers, broccoli, etc.). I think the first thing I would make with the knife would have to be your Tahini Chicken Tea Sandwiches! I LOVE using fennel as an ingredient in everything! My preferred color choice for the knife would probably be peacock. However, the main point of the knife is to be useful, so I would be thrilled to have one in any color. Thank you for the offer! I would make the delicious sounding tahini chicken tea sandwiches! I like the Sherwood knife color. I would make a chicken kiev type of chicken, but instead of the butter I would stuff it with broccoli and cheese instead, not sure if that has a name but love those flavors. 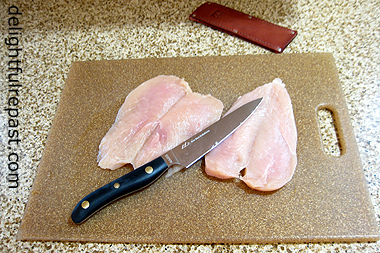 The knife would greatly help with filleting the breasts! Jean, I have never met any kind of tea sandwich I don't like! But you're right, I'm particularly impressed when someone takes the trouble to cut them with care and precisely. I would probably choose the Cadet color knife, but actually, they all look like a splendid addition to one's kitchen. Use the green handled knife to make sliced bagel, onion, cream cheese, and ham, and green olives sandwiches. That looks like a great all around utility! I’ll bet I’d use it everyday! Barb, it's perfect for prepping a stir-fry! Christy, I'm with your son--potatoes are the best! I would make the Sheet Pan Chicken Dinner with Romesco Sauce from August! I would choose the sunburst color knife. Chris, I love the black, too! Judy, I know you'd have a lot of tasty uses for this knife! Nape, thank you. You could definitely use this knife! Chef, that mango curry chicken salad sounds wonderful! Brewbaker, it would be perfect for slicing smoked salmon. Thanks, Amanda. It's perfect for prepping stir-fry! Carole, I did not know that about Frank Sinatra! I could really use this knife. I like the brown wood-tone handle one. Great size for prepping. Thanks, transpearancy. I don't think you can go wrong with any of the colors! Pauline, I almost agree with you, BUT I really don't like smoked salmon tea sandwiches. Princess, that is a pretty color! Freshy, think you're right about the lichen color! Enjoy that snow! Amo Green, I do love my black knife! Oh my! Well, I'd probably say cucumber sandwiches with dill are my favorites. Love 'em to pieces! I make them year round! Although that chicken tahini could give them a run for the money! Jeanie, cucumber and dill, my all time favorite! Sounds like you could really use this knife! Sylvianne, I really like that brown one, too! Of course I'm make your Tahini Chicken Tea Sandwiches! But then I'd likely use it to make some really nice pasta dishes, or some Mexican cuisine. The possibilities are endless with a new toy(oops tool). I like the lichen, too, labsuper! 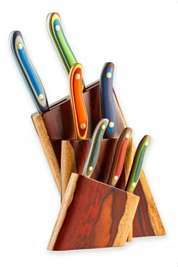 Ooh I would be thrilled - saving my pennies for these gorgeous knives! I would use it for some jalapeño, tomato, mango and onion dicing for some spicey salsa! Hope I’m the lucky lady!! Thanks for the recipe. I would make some chicken salad sammies with capers, yummoooo! I also put bibb lettuce on my sammies and tomatoes fresh from the farmers market..I don't have decent knives in my kitchen so I would love love & more love to win this, I would select the black color too..Love your recipes and your blog...happy new year from our home to yours!!!!!!!!!!!!!!!!! from mjs at mrs.sampson1@outlook.com!!!!!!!!!!!!!!!!!! I'd love to have the red handled knife. I'd probably use it to make meyer lemon marmalade. It would be perfect for cutting the strips of rind! Ooo, that recipe sounds delicious; I might make it first. Also, I LOVE the Lichen color. Thanks so much, mjs. And, yes, I'll take some chicken salad with capers anytime! I would choose the Sunburst. I great tool for meal prep with meat and vegetables. I think I am going after a tenderloin to prepare for roasting. Cheers to you for sharing the opportunity. Lauren, I can tell you, it IS perfect for making Meyer lemon marmalade! InJuneau, it looks like lichen might be the most popular color! Lisa, I use a fair bit of onion myself. I don't put a lot of it in most recipes, but I put a little in a lot of things. Wey, thank you. The sunburst is one of my very favorite New West colors. I'd choose the MTN Huckleberry. Color is so unique. Karen, that one is a beauty! Caederus, I love this knife for tomatoes! I'd cut up chicken with it 1st. I love the red one. Lori, I like the red, too. The Tahini Chick Sands look delicious! Thanks, Victoria! It is definitely my Go-To! 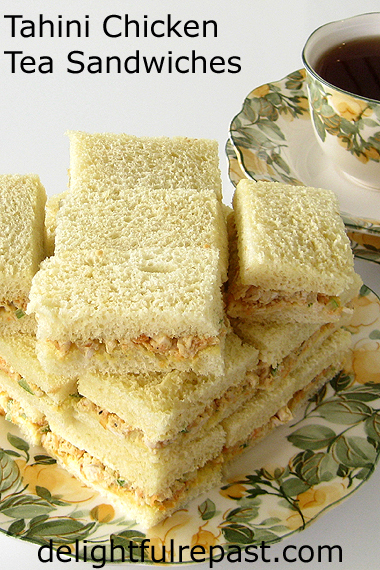 What great timing for you to post a tea sandwich recipe today - and one I have never heard of, too. It sounds delicious. I was searching for a couple of special new ones and here you are being so helpful yet again. I think they would be very good with your cucumber and egg sandwiches. I hope I will get to make them soon. You asked what our favorite recipe might be and I am thinking maybe a chicken tea sandwich that includes fresh strawberries, mandarin oranges, toasted pecans, celery, onions and a poppy seed dressing. I haven't made it yet but think it sounds like it might become a favorite. That knife sounds amazing. I would help round out my knife selection well. I think all black would be my choice, too. Thank you again for your recipes. Wonderful. I wish I could concentrate on these, "fancy" recipes. 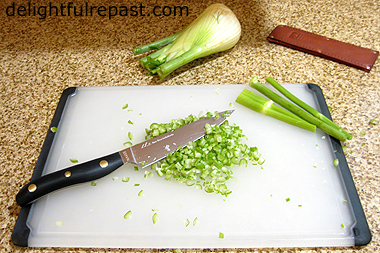 I would use the knife to slice the peppers and onions for my American goulash. Steve, that sounds good! Sometimes the simple dishes are the best. Lily, thank you so much. Wonderful to her from you! Strangely enough this very day I went for a very upmarket (and expensive) afternoon tea at a very upmarket (and expensive) establishment that shall remain nameless. It was good, but I'd much rather have had your sandwich than what I was given by a very upmarket waitress. It does sound lovely. Love this recipe. One of our favorite "tea sandwich" recipes involves buffalo tongue. Not for everyone, but really simple and good. A new knife would come in handy. My family loves these knives! I would make some pork chops! And I like the Cadet knife. Thanks for the giveaway! I'd choose the peacock -- they sure are beautiful knives! I'd first make a gumbo and use it to chop onions, garlic, bell peppers, and celery, and some spicy andouille sausage into bite size pieces, and chicken. The weather is perfect for it! In it. The beautiful huckleberry or Sherwood color knife would make quick work of the preparation. Sunnie, we love pork chops! Rusthawk, the peacock color is beautiful! And that gumbo sounds good. Thanks, Gloria. Those are both pretty colors, hard to decide. Jambalaya sounds good. I would cut yams in strips for my grand daughter - she loves them baked. I'd choose the orange knife (she'd love to see gramma cut her yams with an orange knife). Well, Donna, with this range of colors you could match your knife to just about any food you like! Love seeing a gramma providing wholesome snacks! Tahini was a staple in my Grandmother's house. We had it often in different dishes. Yum! First thing I'd make is your tea sandwiches, although we're going to try them tomorrow. There's a jar of tahini in the cabinet. I like the cadet blue! Thanks! Thanks, Kaycee. Do let me know how they turn out for you. That cadet blue IS pretty. I would try anything at this point cause I am the worse cook ever but I bet the all green knife would cause a miracle to happen and my food would taste good. I like the cadet color. Chicken salad would be the first thing I make. What a delicious recipe and great giveaway!Good luck for all of your readers!Hugs,dear Jean! Thank you for such a great giveaway opportunity! The first thing I would make if I won these knives would be my chicken stew. There's tons to cut up and would really put these knives to good use! Babydollbrown, you might be right--good tools do help us get good results! Leslie, I like the cadet, too. But then I like them *all*--that's why I got black! These little tea sandwiches are beautiful Jean. I've never made them at home, so only know of the ones I've snacked on at official teas. I love them all. Great give-away. Don't enter me - I've got a plenty of knives at my place. Tony, yes, one must cut those crusts off for a posh tea! The tea I was drinking that day was Earl Grey, loose leaf, of course. Tahini is wonderful stuff, if you like sesame seeds. Karenann, a chicken stew sounds soooo good right now! Sully, I thought that knife might "sharpen your appetite!" Lea Ann, thanks. I make them all the time, since I'm all about tea! Like me, you probably have plenty of everything in your kitchen! I have been coveting one of these knives for years! I really love the color Sherwood, and I would use the knife to prep all the veggies for a bowl of warm, comforting minestrone soup. Sheepystitious[at]sbcglobal[dot]net. I love hummus so I'm sure that I'll enjoy your Tahini sandwich. The knife that I won last year has been very useful. Hi! I would peel a few avocodos, onions, tomatoes, and mince garlic to make guacamole!! I like the blue handle . Thanks so much for the recipes.These finger sandwiches are precious. They are on my list to make for the next tea party!! Monica, I love this knife whenever I'm making soup! Thank you, Margie. And sometimes I use hummus as the "spread" on a sandwich instead of the usual condiments. Missy, it's perfect for making guacamole! 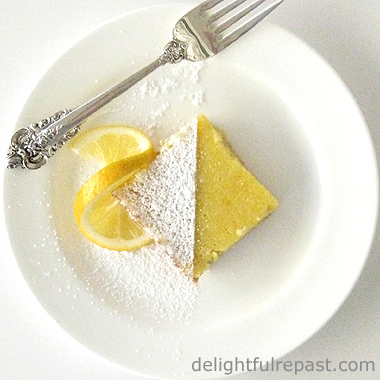 If you need more recipes for your tea party, this is the place! Your tea sandwiches are lovely! A good knife is a joy in the kitchen. I do love tea sandwiches and this sounds delicious. My favorite tea sandwich is in my Recipe Section of my sidebar, though it may taste too much like a dip for your husband to enjoy. (And my photo leaves much to be desired.) Look for Garden Patch Sandwiches. Thank you, Joanne. The turquoise is beautiful, and the handle does indeed fit comfortably in the hand. People often underestimate the importance of the handle! I have been drooling over those knives for the past two years!!!!!!!!!!!!!!!! Your sandwiches look pretty drool worthy also....now I'm craving chicken salad! I love to make curried chicken salad, to change it up a little....but a good old fashioned chicken, tuna, or egg salad is always awesome too! Thanks, Vee. I'll check that out! Thanks, Debbie. Yes, these knives are definitely drool-worthy! Thank you, Jo. I love it (the sandwich AND the knife!). That looks like a marvellous knife, Jean. Pity I can't enter but I know someone will really enjoy that knife! Your chicken salad sandwiches look wonderful, although I don't believe I could eat the sesame seeds. My favourite tea sandwich? Well, I enjoy chicken salad, egg salad, cucumber, as well as tuna. Although I wouldn't turn my nose up at asparagus or cherry and cheese either. Like you, I almost always prefer a tea sandwich over a sweet. And yes, the crusts must be cut off! Enjoy your weekend. Thank you, Sandi. All those sound good to me! I discovered that the international shipping, even next door to Canada, is exorbitant AND the recipient must pay duty, which is quite costly. Happy February! Sounds good, Ashley! I haven't had a salad all week. Cheryl, thanks for the reminder--I need to put up some apples! Let’s start with your chicken salad, and then we will get to the knife! I would never have… in 1 million years… thought of adding tahini to chicken salad. Also, I love that you used fennel! I will definitely give this a try. While I don’t make tea sandwiches very often, Mark and I enjoy chicken salad sandwiches quite often on the weekends. The knives are absolutely beautiful! If choosing a color, I’d be torn between the green and the blue… As for what I would make first? Well, since pretty much everything I make has shallots, I imagine the first thing the knife would touch could be one of those little babies! David, thank you so much. And you know I'm with you on the shallots--all shallots, all the time!--and this is perfect for them. What beautiful colors! I would love to win the Peacock! The peacock is gorgeous, Barbara. This looks/sounds so yum, Jean! As I have two quart jars filled with fennel seed from the garden do you think I could substitute the seed for the root? If so, how much would you use? I love shallots in everything. I also love the addition of apples and sesame seeds to chicken salad. As today is a snowed in day I just might have to use what I have on hand to create this sandwich--and I just happen to have chicken breasts! If I were so lucky as to win this knife any of the colors would be great! Sue, an artist sees the beauty in all colors, so I'm not surprised you're not picking a color! I would perhaps toast a teaspoon of fennel seeds in a small skillet, chop or grind them a bit, and add maybe half of it and see how you like it before adding more. Would be lovely with a tart, crisp apple. Thanks, Jean. I wouldn't want to add too much fennel! And you're right...artistically speaking, all those colors looked yummy. Tahini with the ham. I was reading through a lot of these comments and making me hungry. Great ideas and all sounds so good to me. I would use it to debone chicken and trim meat. I think I’d make some sort of roulade with it first. And then many other things. It is a beautiful knife. I like it in black or desert ironwood. I'd love to use it to prep cucumber and tomatoes for a salad. The all black knife is my favorite..
Michael, it is perfect for those tasks! Jillian, mine has cut a lot of cucumbers and tomatoes! Thanks for sharing another lovely recipe. The uses for this beautiful knife are endless. My husband and I love to go on all day bicycle rides. We pack a picnic lunch to eat along the way, including slices of fruit and cheese. I think your little chicken salad sandwiches would be a great addition. I bought the G Fusion 6" deli knife for my husband for Christmas this year and it has become our "go to" knife for everything. We definitely need another one of these fine knifes to keep us from fighting over the single one we have. Delighted with all the fun colors these knives are available in, but would choose Cadet if I had a choice. Life is too short for a dull knife, adcarlson9@gmail.com. Annie, at least you two share the knife--I don't let anyone touch my knives! :D I keep mine in a drawer no one else gets into, and my husband and anyone else can use the knives in the official knife drawer. Visiting from Esme Salon and was enticed by the photo! These look delicious and I just might borrow this recipe for my upcoming book club meeting! Thanks! Thank you, Savoring Sixty! Hope your book club likes them. Love a good book club! There is nothing like a good knife. It can transform your experience in the kitchen and really improve your cooking! Love this twist on traditional chicken tea sandwiches. The tahini and sesame seeds would really add something special, Jean. Thank you, April. I know you're a woman who knows her way around the kitchen AND a tea room! What lovely Tea Sandwiches, I will love these! Hope you have a great Valentine Week and thanks so much for sharing with us at Full Plate Thursday! Thanks so much, Miz Helen! They go great with iced tea, too. Though it doesn't seem like we'll ever want ice again, does it?! I love Tahini, so this sandwichs sound great ! I can wait to try them for tea time too. Thank you so much, Fabby! Happy February! I would use it especially for chopping fruit and veggies! And I would chose the color CADET if I win! Good morning, dear Jean! Mmmm...what a delicious looking tea sandwich! I will have to save this recipe and make them next time I host a tea party. Thank you, Stephanie. I'm so glad you got here in time to enter! The lichen is one of my favorites. Perfect for stir-fry, Amanda. Now you're making me hungry! Terrific looking sandwich! I don't often make tea sandwiches, and when I do it's usually cucumber. I need to branch out and try these. Thanks! Thanks, John. But, of course, you can make regular size sandwiches, too! Just don't chop the ingredients quite so finely as for tea sandwiches. *Giveaway Winner Announced* - The winner of the New West KnifeWorks giveaway, by random drawing, is “Caederus.” “Caederus,” as soon as you send me, delightfulrepast at aol dot com, your name and shipping information, New West will ship the package. Congratulations! If I don't hear from the winner of the random drawing by 11:59 am Eastern time Sunday, February 17, another drawing will be held and new winner selected from among the original entrants (those who commented before the giveaway deadline). This was fun! Watch for more giveaways here at Delightful Repast! In the meantime, follow me on Google (but not Google+), Pinterest (@delightfulrepas) and Twitter (@delightfulrepas). You can even use the Follow Me By Email button in the right column. Jean I was just about to comment on your cheesecake and then I stopped myself. As much as I love sweets, well you know my situation now, instead I chose this post on your tahini chicken sandwiches, which is so much healthier for me. I do believe we have all the ingredients sitting in our fridge. We are definitely going to try this one out with my kids who love tahini. It also seems to be a very popular choice with everyone judging from all the comments it got! Thank you, Mary. Yes, while I make all my desserts with less sugar than most and eat just small portions myself, I don't recommend desserts to anyone having blood sugar issues. I admire the way you're handling it. Hope the kids like the sandwiches.